This one I picked up on a whim, more or less. 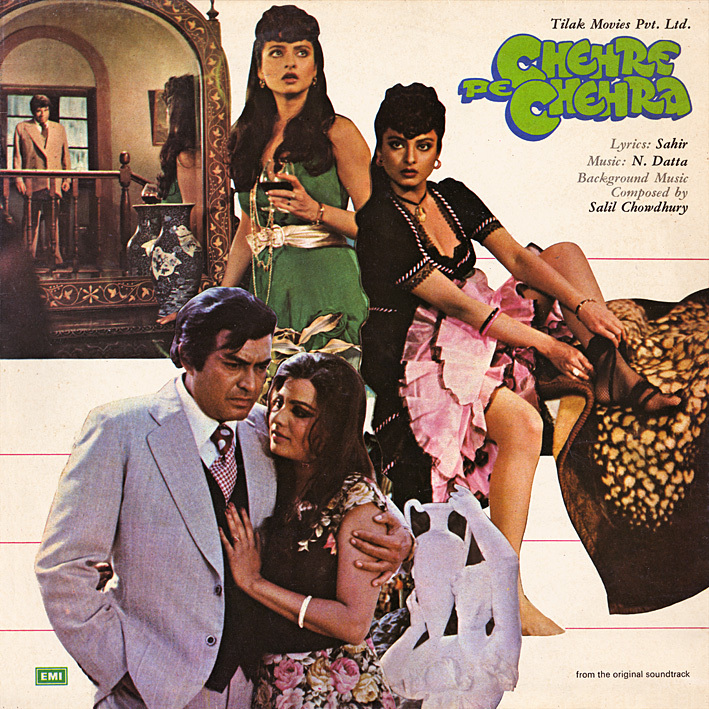 I had no prior knowledge of 'Chehre Pe Chehra' [review], and I had only noticed music director N. Datta (aka N. Dutta, full name Datta Naik) on a Mohd. Rafi compilation before. I guess I wanted to hear someone new for a change. It's nice when impulse purchases work out, as this isn't a bad soundtrack at all. The first couple of tracks are slightly underwhelming (although I find the spaghetti westernish intro to 'Yeh Raat Nek Raat Hai' rather appealing) but from there on it starts getting good. I like the two cabaret/item numbers 'Le Jaam Le Jaam' and 'Main Hoon Pari'. The former seems to be played out in a cantina or saloon of some sort and has a distinct Latin flavour, while the latter is more akin to RD Burman's stuff with it's beat-heavy and effect-filled arrangement. And speaking of Burman, 'Aa Kuchh Karen' which is arguably my favourite track on the record has an intro very reminiscent of the fantastic dance music from 'Mukti'; that was bound to entice me. You'll notice the cover also credits Salil Chowdhury. I'm guessing he was resposible for the incidental music accompanying the film's action and as such had nothing to do with the songs, but I'm not entirely sure. I don't think I've ever come across an extra credit for background music on a Bollywood soundtrack album before. Thanks PC, an unexpected score, N.Dutta was Shankar Jaikishan's assistant and a very talented musician gave music independently in some movies notably "Dhool Ka Phool","Parvarish  etc. Vikram he was not shankar jaikishan's assistant. He was indeed S D Burman's assistant and very nice composer. SJ's assistant was Dattaram and he was not that great composer. I don't really know much about him myself, but Wikipedia at least confirms the SD Burman connection. Yes!!! bro. you are right it is not N.Dutta but Dattaram who was an assistant of Shankar Jaikishan. Dattaram is was not as popular as N. Dutta. Salil Chowdhury was quite well-known in Mumbai for his background music composition skills. He has composed just the background music for films like "Kanoon", "Kala Patthar", "Ittefaq","Achanak","Mausam" etc when the songs were composed by some other music director. He was often used by Hrishikesh Mukherjee, B.R.Chopra etc. Besides these he had composed the background music for numerous Films Division documentaries and TV serials. Wasn't aware if that, thanks for the info.